Your wedding dress is more than just a dress. Like the rings, the bouquet, and the cake, your gown is a symbol of the love between you and your spouse, an enduring remembrance of the day you said “I Do.” But, even more than that, for a bride, the wedding gown has even greater personal significance – for all brides feel the most beautiful they’ve ever felt on their wedding day.When a bride walks down the aisle in a gorgeous gown, and all eyes are fixed on her – a moment is born that she’ll remember fondly for the rest of her life. Because of this significance, for many brides, the price of a dress doesn’t matter. It’s incredibly special, which makes it incredibly worth it. A bride may only wear it for a few hours, but she will cherish it for a lifetime. Whether your wedding dress will become a priceless family heirloom, or something you can look at and remember your wedding day by, you’ll want to keep it in the best condition possible, for as long as possible. This process of preserving your wedding gown starts long before the wedding takes place, way before you find something borrowed, or blue, or choose a florist. It begins at the dress store. It’s important that you talk to the sales consultant. Ask Questions. Find out how difficult the dress is to clean, what precautions are necessary to keep the sequins or trim bright and in order, or anything else that comes to mind. Prevention could save you a lot of time down the road. This advance thinking won’t only help you keep the dress clean 30 or 40 years from now, but on the day of the wedding. The Wedding Dress experts will give you some tips on managing Dress Stains, and tell you what to do in the case of an emergency. Also, and this in important, make sure you transport your dress in a cotton, not a plastic bag. Plastic is doubly bad. It not only keeps the fabric from breathing, but exposes it to toxic plastic fumes, which will cause discoloration. If you are going to clean and store your dress yourself after the wedding, make sure you buy the supplies well in advance. That way, if you’re rushing off to an exotic destination after the big day, you’ll have less to worry about. Before you head off on your honeymoon, make sure you check the dress for any stains, tears, or other damage. Catching these things early can keep them from becoming worse. Stains, when left for too long, become impossible to remove – but if you catch them right away, then you should be able to take care of them before they set in too deeply. If you’re leaving right away, have a close friend or one of your bridesmaids keep the dress safe for you until you return, either by having them carefully hang it up or take care of the more expansive cleaning duties themselves. Truthfully, the sooner you have it cleaned the better it will look in the long run. If you are handy with a sewing kit, you can always mend hems and fix lining yourself, but if don’t want to do it yourself, no worries! Many dry cleaners can take care of small repairs for you. Just make sure you write everything down, and discuss it with your dry cleaner. When you pick it up, it should be as good as new! After the dress is dry cleaned, give it a few days worth of air – and remember, no plastic bag! If it’s going to be packed away, it will need good ventilation. When it comes to packing, think acid-free or pH neutral. The last thing you want to do is store your cherished gown in a box that will discolor it. There are many sturdy paperboard boxes – some even with convenient viewing windows – which are the best option. 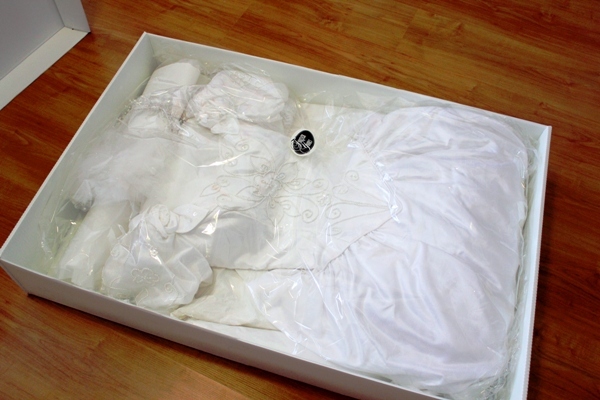 Before you place the dress inside, line the box with white acid-free tissue paper. Colored tissue paper will undoubtedly stain your dress. Fold the dress gently without creasing it. The dress should fit snugly, but shouldn’t have to be forced in. Make sure it has a little room to breathe. If you want to be extra sure of its protection from damage, wrap the dress in muslin before placing it inside the box. Keep your wedding dress box out of the sunlight, especially if it has a window. Also, even though you don’t want to do it too often, it’s ok to take out your gown and look at it every once in a while – this will give it a chance to breathe and prevent musty smells from taking over. While you’re reminiscing, check the box, make sure it hasn’t undergone any damage. Over time, to protect your dress, you may need to change the packaging, but this won’t need to be done often.